Our range of products include oil radiator. We are best known manufacturer and exporter of Oil Radiator. In any process industry, where heating of oil is involved, we offers a variety of Oil Radiator which are mostly of finned tube type. In these cases, air from a centrifugal blower is sent across several rows of finned tubes that carry steam or thermic fluid on a multi-pass arrangement. Client can avail this product at very nominal price rates. 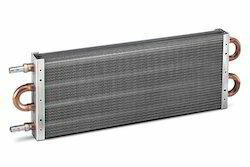 Looking for Oil Radiator ?